Intensification has to be sustainable, with more prudent use of inputs, lower greenhouse gas emissions and with positive growth in natural capital and resilience. Smallholder farmers are important to agriculture in developing countries and so will be responsible for much of this task, but if they are to meet these ambitious targets, improving their access to modern farming information and technology will be vital. Indeed, truly sustainable intensification will require more than just inputs and technology. According to Sir Gordon Conway, a contributor to the 2013 Montpellier Report, sustainable intensification should now be the basis for all investments in farming, both big and small. To find innovative, sustainable farming strategies that address the challenge of getting ‘more with less,’ and take a broader approach to system intensification (including conservation agriculture elements, soil fertility, pest management and diversification), MAIZE is working through a competitive grant with David Mariote, maize breeder at the Agricultural Research Institute of Mozambique (IIAM) on promoting conservation agriculture technologies in cereal-legume based systems in Mozambique, and also with the Australian Centre for International Agricultural Research (ACIAR)-funded* Sustainable Intensification of Maize-Legume Systems for Food Security in Eastern and Southern Africa (SIMLESA) project, partnering with national agricultural research institutes from Ethiopia, Kenya, Malawi, Mozambique and Tanzania. A similar initiative, SIMLEZA, is funded by USAID and has been operational in the eastern province of Zambia, in collaboration with the national program and IITA. 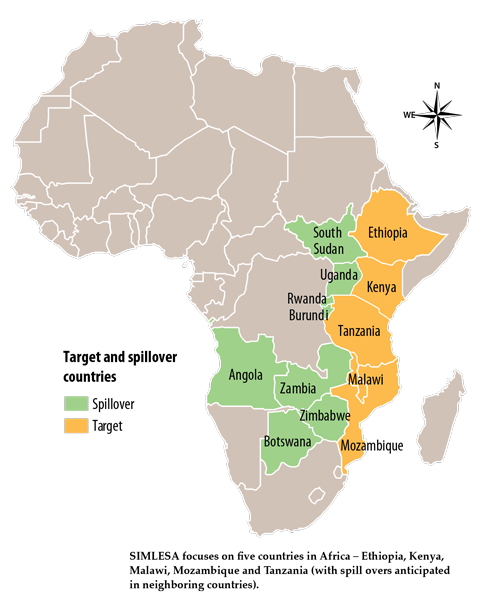 In these six SSA countries, maize is the main staple and legumes are an important source of protein for the rural poor. Legumes are widely used as an intercrop and/or rotation crop in maize systems, and are also a significant source of income for women. In addition, the intensification and stabilization of rain-fed maize-legume cropping systems offers considerable promise for boosting productivity, improving food, feed and nutrition security and helping reverse the decline in soil fertility. 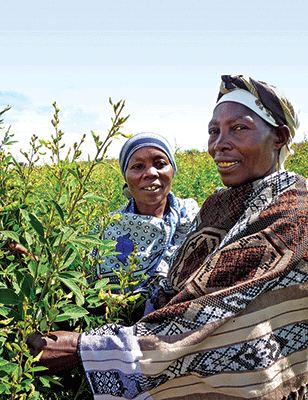 Through participatory research with farmers, extension agencies, non-governmental organizations, universities and agribusiness, the initiative aims to improve maize and legume productivity by 30 percent and to reduce the expected yield risk by 30 percent on approximately 650,000 rural households within 10 years. But to reach this ambitious goal, a more rapid adoption of technologies among farming communities is essential. “There are so many different technologies bombarding farmers. The real work therefore lies in dealing with the psychological, social, cultural and environmental factors of the farmer that will determine the adoptability and adoption of introduced technologies,” said Derek Byerlee, co-chair of the SIMLESA Steering Committee, during the project’s annual regional planning and review meeting, which took place in Mozambique in early 2013. In Kenya, local innovation platforms which have emerged from the project have begun to have the desired impact on farmer practices. In October 2013, scientists from CIMMYT, KARI, SIMLESA and ICRISAT visited farmers in western Kenya who are members of the Boro and Bungoma South farmer innovation platforms. During the visit, farmers described how they had adopted conservation agriculture and intercropping, and switched to using herbicides to control weeds. 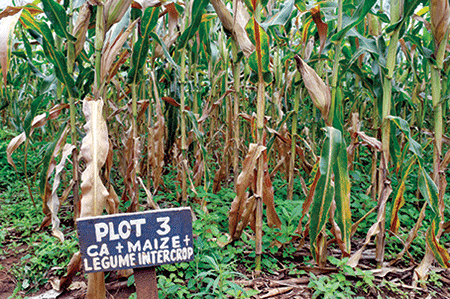 Farmer Ferdinand Makhanu reported how his maize harvest had risen from 10 to 15 bags. “I attribute this yield increase to utilizing the rich information I got during innovation platform meetings,” he said. A great deal of progress occurred in 2013. “SIMLESA has attained a ‘steady flight path’ and is on track to deliver significant impacts,” Byerlee stated. In Tanzania, SIMLESA signed a memorandum of understanding with three partners for production and scaling out of two newly released maize varieties, bred by a local seed company. The number of innovation platforms also increased in Tanzania, in order to promote the adoption of sustainable cropping systems and improved crop varieties. In Mozambique, representatives of the public extension services and development agencies have devised action plans to implement gender-sensitive approaches in their work, with specific targets for the 2013-2014 cropping season. This was one outcome of a two-day gender-mainstreaming workshop in August, which revealed a widespread poor understanding of gender concepts, including, for instance, the inequality in how farmers are selected to take part in demonstration trials. The workshop introduced a range of tools for integrating gender in extension activities in order to reach vulnerable groups. *Additional partners include the Association for Strengthening Agricultural Research in East and Central Africa (ASARECA), the International Center for Research for the Semi-Arid Tropics (ICRISAT), the Agricultural Research Council of South Africa (ARC RSA), the Department of Employment, Economic Development and Innovation, Queensland, and Murdoch University in Western Australia.